Vector network analyzer (VNA) test cable kit from Pasternack Enterprises. Our VNA cable kit is for Agilent, Anritsu and other vector network analyzer test equipment. This cable kit for VNA testing uses 3.5mm NMD connector ports. 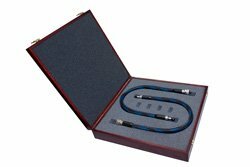 VNA test cable kit includes highly flexible test cable construction that has excellent electrical characteristics with outstanding phase and amplitude stability. This Pasternack VNA cable kit incorporates a unique interchangeable head design with a 3.5mm NMD connector port. These vector network analyzer test cable connector optional components are precision models of 7mm, type N, 3.5mm and 2.92mm connectors.